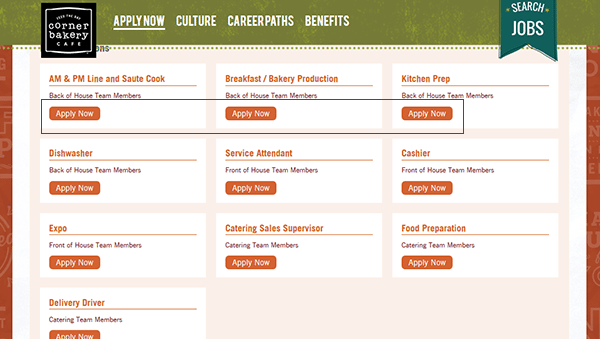 Learn how to fill out and submit the Corner Bakery Cafe job application by following the instructions in the below guide. The application is available on the company’s main jobs website. Several different career types can be applied for including hourly, supervisory, management, and corporate positions. Learn more about the company’s online hiring process by reading the section posted below. About the Company: Corner Bakery Cafe is an American chain of “fast casual” cafes headquartered out of Dallas, Texas. The company has more than 100 locations throughout the United States. Step 1 – The first step of the online job search process is to go to the company’s main jobs page. Click here to open this page in a new tab/window. Step 2 – Select which type of career you’re interested by clicking the appropriate tab (i.e. hourly, corporate, supervisor, etc.). Step 3 – Search for locations within your area by filling out the search form (select a search radius/enter your zip code into the input field). Click the “Go” button to view the list of results. 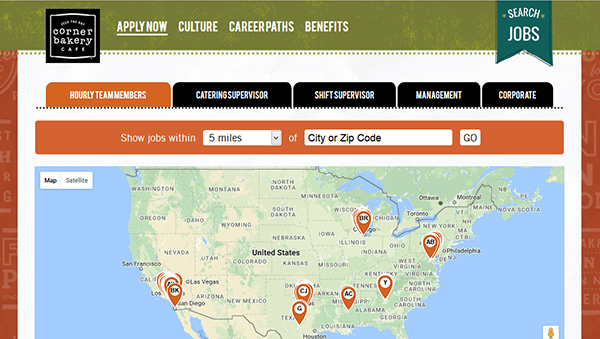 Step 4 – Click the “View Job Openings” button (of the location that you’re interested in applying to). Click the title/link of the position that you want to start the online application process for. Step 5 – Review the job description page and then press the button as outlined in the below image. Fill in your email address/create a password and then press the “Create Account” button. Step 7 – Complete the “Select Source” and “Rehire Check” sections. Continue to fill in the required details for any/all remaining sections of the form until you are able to submit the application.